We’re in Long Beach, California to pick up our vehicle which we shipped from Guam. The ship arrived on Sunday, the car was off-loaded on Monday but, because we were required to use a Customs Broker who turned out to be the most inept and unconcerned person I’ve met in a long time, we’re still here 5 days later (Thursday afternoon). She made an error on the forms which caused us to be here over the holiday and then we found out the dock workers are off today due to some dock workers holiday. Fortunately for the customs broker, FM is keeping me away from her until we actually get the car because I’m more than ready to let her know just how I feel about the entire situation. The ironic thing is how some people talk/complain about things not getting done on a timely basis in the islands but this goes to show it can happen ANYWHERE. The original plan was to pick up the car on 3 July at the latest and we would start a leisurely drive to Kansas stopping in to visit friends along the way. Now, if we don’t get the car tomorrow, FG and I will be driving and FM will fly since he HAS to be there on Sunday. 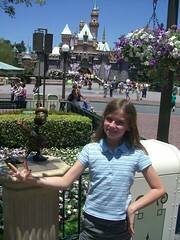 Disneyland is only 30 minutes away so we went there for a day. FG loved hearing everything in English and she’s pretty pleased that she’s been to two Disneylands in one year, Tokyo and California. Since it was the 4th of July, the ship was very festive and there was even a wedding going on. We didn’t stay for the fireworks though ~ way too many people and we were too tired. 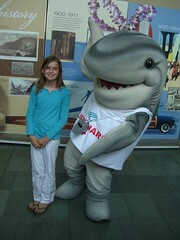 The aquarium was fun especially the “pet the sharks and manta ray” section as well as the sea lions and sea otters. Those sea otters couldn’t get any cuter if they tried. They always put a smile on my face. There was a whole exhibit dedicated to “Palau” which we really enjoyed going down memory lane especially seeing all the fish we saw “in the wild” during our snorkeling there. FG loves all the spanish speakers here since she wants to learn spanish. We even have the car radio tuned to the spanish music station for her which is fine with me since I can still understand a lot of what is said in spanish. Hopefully my next blog will be from somewhere PAST Las Vegas! Nicole: Maybe you should do a “Throwback Thursday” and post the photo with you and your dad in front of the Queen Mary. Patti, I’m sorry to hear that you had such a hard time getting your car! Good for you to make use of your time and enjoy a little bit of the California sunshine. Enjoy your cross-country drive. We’re looking forward to hearing more of your exciting adventures. 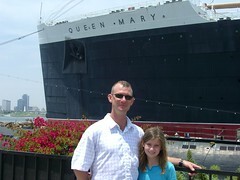 Believe it or not, I have a picture-my dad and I-when I was about 13, in front of the Queen Mary. So sorry! This sounds terrible. I do hope all is resolved today. I could tell you a horror story about the last time we shipped a car back from GE and how it ended up in Halifax Nova Scotia, but I don’t think this is the time. I hope FG’s experiences with Americans improve. I remember the DC area to be terribly rude and racist. People seemd to have a chip on their sholder about everything. We have been pleasantly surprised with how friendly and helpful the people of Norfolk have been. Of course, I do speak the “language” here and Pete says that I have gone native quickly. It is good to be back in the south.